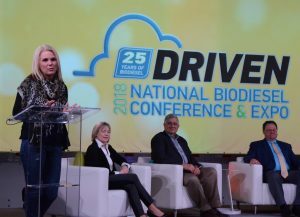 We jumped in the passenger seat of the 2018 Ford F250 Super Duty during the Biodiesel Ride & Drive to take a spin around Fort Worth and learn more about biodiesel’s capabilities. Joining us was Ginger Kasanic, Sustainabilty and Advanced Technology Manager, Ford Motor Company; Jennifer Weaver, NBB and representative from local dealership, McDavid Ford. The Ford F-150 joins the F-250/350/450 Super Duty and F-650/750 medium-duty trucks as well as the Transit van to round out Ford’s strong line-up of diesel models supporting the use of B20 biodiesel blends. In mid-January, Ford dealers begin taking orders for the 2018 F-150 with all-new 3.0-liter PowerStroke® diesel engine, and deliveries begin this spring.